Christmas Day was spent with my mum, in the morning, and my in-laws, and fiance, in the afternoon. It was quite a relaxed day with lots of delicious food, and some brilliant presents! This is what I received on Christmas Day... The super cute cat slippers were a gift from my mum (she knows I'm totally a crazy cat lady!) My in-laws got me the Whiskers Doorstop, Jewellery Box, Dairy Milk Snow Bites, Dairy Milk Marvellous Smashables Jelly Popping Candy, and Unicorn Pandora Charm. 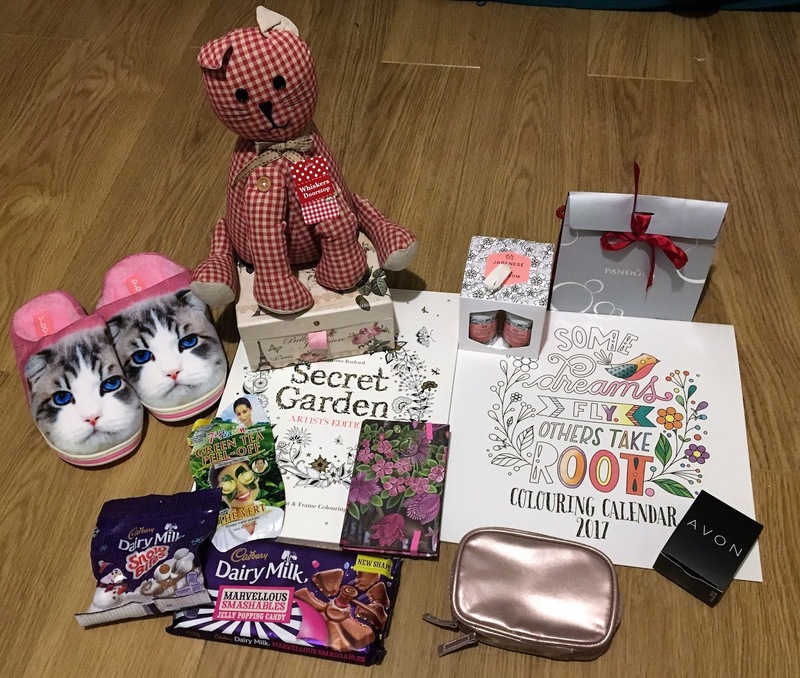 The Body Shop Japanese Cherry Blossom shower set, Johanna Basford Secret Garden Artist's Edition, Green Tea Peel Off face mask, notebook, and Marks and Spencer Colouring Calendar were gifts from friends. 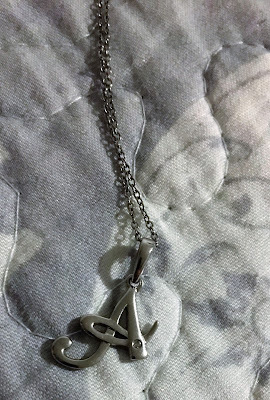 My fiance's gran gave me the Avon Prepare to Party Emergency Set (which includes a compact mirror, hairbands, a comb, nail file and gel insoles), and an A necklace. 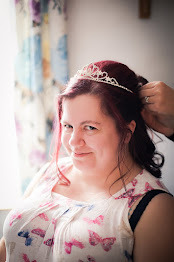 I'm starting to think I should have taken the photos in a more organised manner...I'll make a note of that for next year! 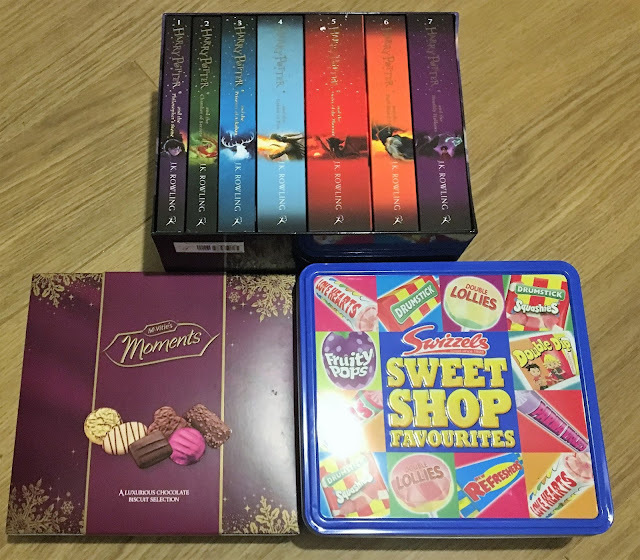 Another few gifts from my mum, opened in the morning of Christmas Day; Swizzels Sweet Shop Favourites and McVitie's Moments. The Complete Collection of Harry Potter was a gift (chosen, and ordered, by me) from my fiance. He's the practical sort; prefers to get you something you actually want! My mum also got me a super warm and cosy Tatty Teddy Zip-Up Dressing Gown. I had wanted this dressing gown for ages, but couldn't afford to buy it for myself when there were Christmas presents to be bought! My mum remembered, and made sure I had it for Christmas; isn't she a star? 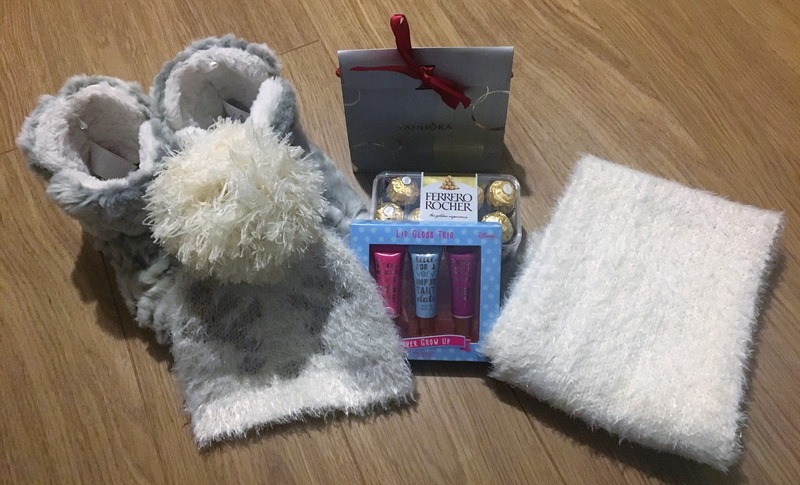 The super cute, fluffy Debenhams slippers and Disney Lip Gloss Trio were from my Aunt, Uncle and Cousins. I was so pleased with the Disney Lip Gloss because, in the 3 for 2 deal at Boots earlier this month, I picked up an Alice in Wonderland makeup bag. So now I have lip gloss to match! The Sainsbury's hat and scarf, granddaughter charm (below), and I Love Reading Pandora charm were gifts from my grandparents. They know me so well! If you follow me on Twitter, you may have noticed me tweeting that I didn't receive any Ferrero Rocher this year. I was disappointed because, well, I can't remember the last time I didn't receive Ferrero Rocher at Christmas! Well, my mum only bloody turns up on Boxing Day with a box of Ferrero Rocher doesn't she? Didn't I tell you she's a star?! And the final present I received was from my mum, and it was a stunning Tanzanite with White Topaz ring! And that's it, for this year! I feel so grateful and thankful for all the lovely gifts I received! I know I'm very lucky; believe me, I don't take anything for granted. 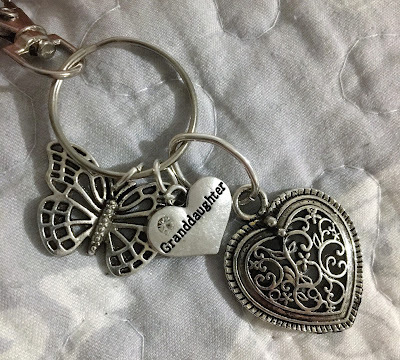 I hope you enjoyed reading this, and if you have a What I Got For Christmas post of your own please leave me a link. I'd love to read them! Those cat slippers are hilarious! I don't see why these posts have to be controversial; if someone doesn't like a certain type of post they don't have to read it. But that's the internet for ya! I'm like your fiancé in that I buy presents people actually want or need because they're the types of presents I like to receive. I love these kinds of posts! 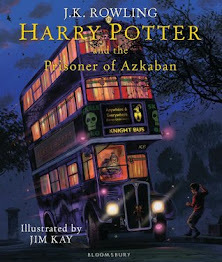 You certainly got some gorgeous goodies, i love the full collection of HP books!